As disruptive technologies, like cloud computing and mobility, continue to change the way services are delivered, enterprises need to push for better security. Today’s adversaries continue to increase their capabilities faster than the defenses deployed to stop them. This is especially true in first generation network security devices that restrict protection and policies to ports and protocols. Enterprises need to be able to provide a similarly flexible mechanism of protecting key assets from attacks. 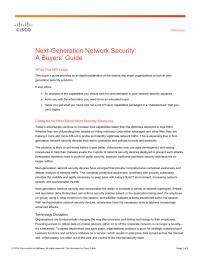 Download this white paper to examine the factors that impel organizations to look at next generation security solutions, including what capabilities you should look for and demand, as well as information you need to be an educated buyer.